Just-In Time Electrical offers a fast response emergency electrician service. Our fault finding skills are surpassed by none our tradesman test day in and day out. Our technicians are highly trained and carry all the latest test equipment to ensure that when you have your power issue we get it sorted ASAP. We pride ourselves in locating faults and offering solutions, we carry the latest fault finding equipment. If you have no power or just need an electrician now call Just-In Time Electrical we will get your power back on fast. A quick word of warning please do not touch exposed wiring or fallen power lines. Electricity is extremely dangerous and an electrical shock can result in death – you wont get a second chance. Don’t risk it call an local electrician you can trust. Just-In Time Electrical offers a full 24/7 emergency service that operates 365 days of the year. 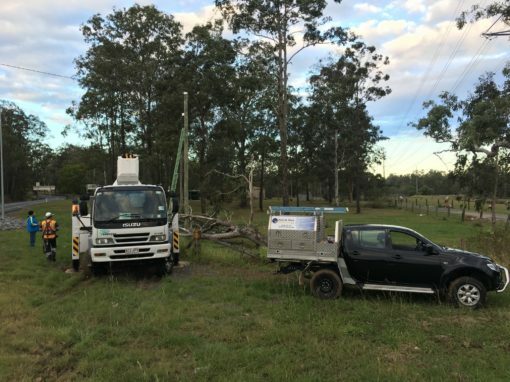 With electricians all over Brisbane we can have someone to you fast, our electricians live locally which means we wont be far away. Call your emergency electrician now – you wont be disappointed. We will be there for you no matter the time of day to assist you to get your power restored. Our vehicles carry most the common parts required to fix your emergency power outage. Our technicians are specifically trained to locate faults quickly and carry out the required repairs. Our after hours service is first class, you will not be disappointed with the quick response. We only stock and use reputable brands that are bought from Australian wholesalers. Your repairs will be covered by our 5year workmanship guarantee. Don’t get stuck on call to a company that is full of promises and wont deliver. If you have no power at all it’s a great idea to check the Energex website or call 13 62 62. If they don’t have any registered outages in your area call us and we will be there fast. Our team of expert electricians can locate and repair electrical faults quickly. If you have had damage to overhead supplies, poles or underground power we can get you back up and running. Has your safety switch tripped? How do you reset a tripped safety switch? 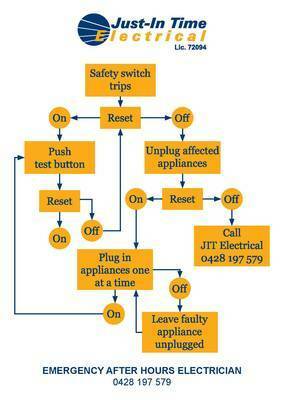 You have come to the right place, tripped safety switches can sometimes be as simple as turning it back on or finding that faulty appliances that has caused it to trip. So some tips and tricks you can try before you have to call out the best Emergency Electrician for after hours call outs. Try these tips and check out the flow chart it gives a guide on finding a faulty appliance that may have caused your power to go out. But please if you don’t feel 100% confident with what you are doing call us, risking electric shock is not worth it. If you get one of our trained electricians you will get an expert in testing they will quickly be able to locate your fault using the latest test equipment. Once rectified they will get your power back on safely.